As part of our ongoing support for the U.S. Energy Information Administration (EIA) and other government agencies, OnLocation has been studying the potential impact of large amounts of solar generation on grid stability as it relates to the National Energy Modeling System (NEMS), as described in a previous blog dated May 25, 2016. The issues stem from the timing of solar generation during the day, particularly in months when electricity demand is relatively low such as early spring before air conditioning is needed. 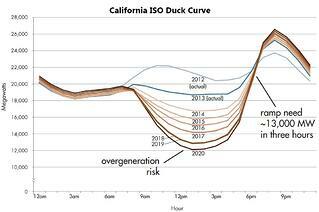 The potential impact on the grid from the high daytime solar generation on days with low electricity demand and the corresponding steep reduction in solar in the evening has been dubbed the “duck” issue by the California Independent System Operator (ISO) and has been the subject of speculation in recent years. The duck phenomenon was evidenced this March in California when the system average hourly prices dipped below $0 per megawatthour (MWh) in the morning hours, as described in last week’s EIA Today in Energy article. The solar issue presents unique challenges in NEMS and other policy models. As the cost projections for solar continue to decline, some recent model scenarios predict large amounts of solar photovoltaic (PV) capacity in future years. However, the aggregate nature of NEMS, as well as the way the load slices are defined, masks the potential impact of this wave of solar generation on the grid. Before modifications were made to address this issue, the model was unable to recognize the need to curtail some of the solar generation during hours when load requirements cannot absorb the generation while maintaining adequate baseload capacity that can be ramped up when generation declines rapidly at dusk. This model formulation resulted in an overvaluation of solar generation because of the potential reduction in revenue for generators during curtailment periods. Other electricity policy models likely have similar issues due to the need to represent loads in an aggregate manner and the increasing amount of renewable energy on the electricity system. OnLocation identified the “duck” issue and designed and implemented a solution for NEMS that was adopted by EIA and has been included in the AEO 2017 version of the model. OnLocation will continue to work with EIA to improve the model’s ability to respond to future energy market issues. To learn about the NEMS model and how OnLocation can help you explore issues related to the potential role of renewables in energy markets, visit http://www.onlocationinc.com/contact-us. OnLocation is a leading energy consulting firm that uses quantitative analytical methods to inform strategic players in the energy industry to improve outcomes. In this space we bring you the highlights of OnLocation's research and policy-relevant insights and debates. Subscribe to stay abreast of the latest energy news as it relates to environmental, resource, and policy economic impacts. Sign up for the OnLocation blog alerts to get the lastest news relating to energy economic and policy impacts.